Click on image to open book at Amazon. Image: Rowman & Littlefield 2011. No copyright infringement is intended. My book, with co-author Rena Down, The Organ Donor Experience: Good Samaritans and the Meaning of Altruism, was published by Rowman & Littlefield in October 2011. You can order it at Amazon.com and Barnes and Noble.com, as well as various international on-line booksellers. (Print and e-copies are available). "Bramstedt & Down's The Organ Donor Experience has done what none have before: tell the story of all phases of organ donation from the donor’s perspective. By doing this, the reader is thrust into the mind of the donors, to understand their motivations and ultimately, what is altruistic behavior. 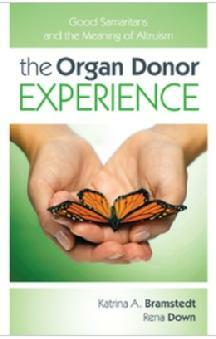 This is an essential read for all those interested in organ donation." Click on image to access book from publisher. Image: Hilton Publishing 2012. No copyright infringement is intended. "I had the opportunity to read a pre-publication of this book [1st Ed]. It is simply outstanding. 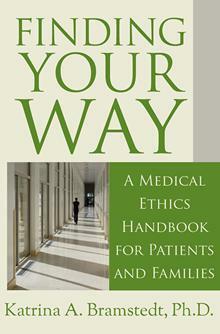 It was genius to concoct such a book, and the book itself is jam packed with indispensable knowledge for patients and families who expect to encounter or have encountered a problem that tests their values and beliefs. Highly recommended!" 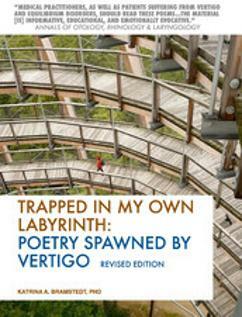 Trapped in My Own Labyrinth (ISBN-13: 978992597719, Salvataggio Press, 60pp, 2014) is a collection of poems, written as a form of narrative medicine, while the author was suffering from vertigo. The poems (each linked to an image) are presented in chronological format, from illness onset, through various treatments, and recovery. The poems are a deep insight into the world of suffering that occurs in patients who have balance disorders such as vertigo. The book is available as an iTunes download. Click on the book image to open the link. 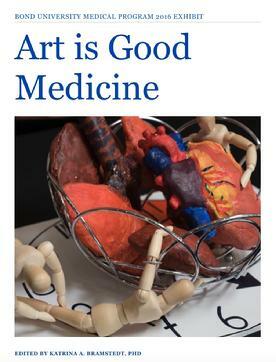 Art is Good Medicine (ISBN-13: 9780992597733, Salvataggio Press, 70pp, 2016) is a collection of photographic images of mixed media artwork created by 26 medical students and teachers at Bond University (QLD, Australia). The artwork was displayed as a formal community art exhibit during Medical Humanities Week in March 2016. The book is free for viewing on iPad and Mac systems. Click the book image for free access.